Anne gets schooled on Sunday night | TV, eh? Eight one-hour episodes is a lot of time to break down Anne of Green Gables. Perhaps that’s why last Sunday’s instalment, “I am no bird, and no net ensnares me,” didn’t contain anything from the source material. Anne didn’t make it all the way back to the orphanage, earn a ride helping the milk delivery man or sign the Cuthbert’s bible. It certainly didn’t detract from my enjoyment. Yes, some of you let me know none of what happened was in the source material, but you also noted you’re enjoying Moira Walley-Beckett’s take on L.M. Montgomery’s classic. That’s pretty high praise, I think, and Walley-Beckett and CBC should be proud of that accomplishment. Anne is excited to begin school and make friends, but is unprepared for the bullying that occurs when she doesn’t fit in. Marilla too, is testing new waters as she accepts an invitation to join a “Progressive Mothers” group. And here some notes from us after watching a screener. Playing such an iconic role is tough, but McNulty makes it look easy. As Walley-Beckett told me earlier this year, “Amybeth is fiercely bright and independent, spirited and incredibly sensitive and also has a worldly perspective, which is something we touch on again and again in Anne. She was it.” She most certainly is it, showing an incredible emotional range for such a young actress and able to go toe-to-toe with her veteran co-stars. I can’t help but smile every time she delivers a rat-a-tat-tat piece of dialogue, not waiting for an answer from Marilla or Matthew or anyone, really. Anne’s long walk to school is full of conversation … more of a soliloquy if we’re being honest. We know Anne’s head is full of fantastic stories and characters, and she certainly has dreamy expectations of what school will be like. 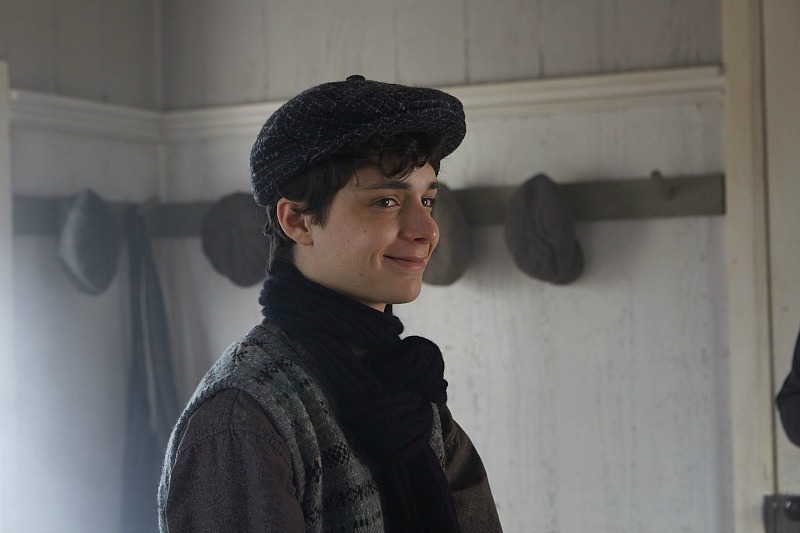 Unfortunately, she runs into bullying and meets her academic nemesis in Gilbert Blythe (Lucas Jade Zumann). School isn’t all bad for Anne; there is a very funny moment between she and Diana as they discuss babies and pet mice. I’m interested in hearing what fans think of Gilbert, so let me know after you watch the episode. Anne isn’t the only one trying to fit in. Now that Marilla has a daughter, it opens the door for her to become a member of the Progressive Mothers Sewing Circle. The group meets to discuss how their daughters should be educated, to do needlepoint and sip tea. Her attendance at her first meeting causes Marilla to wonder if she’s up to the task of raising a child. And not everyone is a fan of her being part of the Progressive Mothers Sewing Circle. Anne airs Sundays at 8 p.m. on CBC. I agree that Amybeth truly brings Anne to life, yet with a modern twist as the show is written. She truly embodies the character and I think L.M. Montgomery would approve. The heavy themes of bullying, feminism, and exclusion are interesting ones for me to synthesize into my understanding of L.M. Montgomery’s literature. I like Gilbert Blythe’s portrayal and his age seems appropriate, which seemed to be lacking in the many other renditions I have seen of Anne of Green Gables. Overall, there are notably differences versus the books in the first three episodes I’ve seen, which always leave me pondering, but I think the show is fit for the times. If you’ve ever seen old screen renditions or even old book covers, it always strikes me how Anne looks appropriate to the times and can always resonate with the current audience. This series is great and I like how the drama is relevant. Thanks so much for your feedback. I really like this version of Gilbert; he’s compassionate and I appreciate his comment that it doesn’t matter where Anne is from. I really wanted to watch this but I worked the evening shift at the nursing home last night so I saw bits and pieces of it as it was on in various resident’s rooms (the story is very multigenerational in appeal). I look forward to watching it in the near future but I have to wait for my 7-year-old because she wants to watch it with me (she loved the first episode) and because I’m on evening shifts it might not be till the weekend. I like this version much better than the one that aired on YTV. The other one is an inferior replica but this version adds to the story. Hopefully, the story doesn’t stray too far from the source material but I like the idea of filling in all the inbetween parts with a new story to enrich it with. Its so hard to cast well for a new version of a show or movie in which the previous version was cast so well (such as is the case with the 1985 series) but I think they did well with the casting. I haven’t seen Gilbert yet and I’ll be sure to give you my opinion when I do. Just the other day I caught my daughter watching Road to Avonlea, one of my Canadian favourites of all time and another series adapted from L.M. Montgomery’s literary world. It was the episode in which Marilla died and Gilbert came to town for the funeral (without Anne who apparently had scarlet fever). It brings me back to my childhood and how much I loved all the books L.M Montgomery wrote and I loved Anne of Green Gables, the miniseries, and Road to Avonlea, the tv series. I was really disappointed in the Anne sequel because it completely deviated from the book but when I read The Story Girl (which Road to Avonlea was based on) I felt that all the ways in which the tv series differed from the book made the tv series better so it worked. I didn’t feel the same way about Emily of New Moon though. Anne was always more popular as a book series than Emily, but Emily was more of a favourite of mine (the book series, not the tv series) and I found that after the first season of the Emily of New Moon tv series, that too much changed from the books in an effort to carry the show as a longer-running tv series and I really didn’t like it. With Anne of Green Gables as a tv series, rather than as a miniseries, there is so much opportunity to do well and I hope that the writers will do a much better job than the writers of the Emily of New Moon tv series. They’ve at the very least gotten off to a very good start, CBC made a good decision by putting a new Anne series on Sunday nights and giving it Heartland as a leadoff. She is a wonderful actress . Enjoying this series she sweeps you up with her emotions. As a lover of all things Anne, I turned to my husband today and declared that I was officially ‘in’. I am really loving this version. And I’m an Islander (now living in Toronto though). I was s skeptical and anxious. And eve as I watched the first couple episodes I was hesitant – did I like it…I was thinking I did, but I have such an emotional connection to this series it took me a few episodes to fully accept that I was sold. Amy her is brilliant as Anne. She’s truly captured the spirit. Her walk to school this episode or soliloquy as you accurately called it, was very moving. I was so nervous for Anne. And there was such thus earnest sweetness about her. And Gilbert. Dear, sweet, lovely Gilbert, I SO approve…and I truly thought I never would because Jonathan Crombie was perfection. But this new portrayal has really has captured how and why Gilbert is Gilbert. This new version is neither feminist nor empowering. The message is that women have always been, and continue to be, defeated by the world. Although the acting is marvelous, the dark take does not express anything helpful, nor make PEI a desirable destination, more’s the pity.